Allied prisoners of war plan for several hundred of their number to escape from a German camp during World War II. The wife and mistress of a loathed school principal hatch a plan to murder him while having the perfect alibi. They carry out the plan...but then his body disappears. Q: Is 'Judgement at Nuremberg' based on a book? Q: I must be feeble-minded. I didn't get the feeble-minded test. They say that time heals all heartache. In the case of the Third Reich, I'm not sure that the old saying is true. Out of respect for the Holocaust victims, and as an important history lesson, there's something to be said for not forgetting the evils of Hitler. Fortunately, we have this great film to help us not forget. 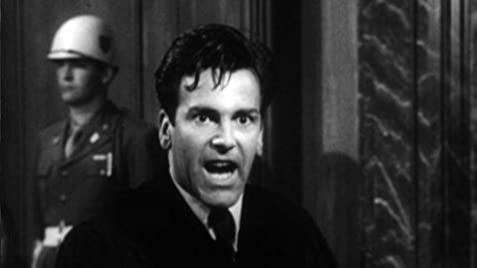 "Judgment At Nuremberg" is a dramatization of one of the many real life post WWII Nuremberg trials of high ranking Nazis. Most of the film focuses on the 1948 courtroom trial of four judges who helped to carry out Hitler's decrees. As part of the prosecution's case against the judges, real life, graphic film footage showing the horrors of the death camps engenders a gut level impression that is both powerful and persuasive. The film thus educates viewers in ways that a dry textbook of facts and figures never could. But there's more to the film than the trial. In other parts of Nuremberg we see ordinary Germans trying to get on with their lives as best they can, three years after the war's end, in a bombed out and bleak city. One of these persons is Madame Bertholt (Marlene Dietrich), the wife of a dead German soldier. In contrast to the harsh and contentious trial, Madame Bertholt's kindness toward the tribunal's lead judge, Dan Haywood (Spencer Tracy), provides an example of the innocence and decency of ordinary Germans, and thus adds a softer, more contemplative perspective to the ordeal. In these non-courtroom scenes, the melancholy background music and the soft production lighting create a mood of depression and sadness. I find very little to criticize in this three hour film. Perhaps the plot could have been clearer in identifying the legal counsel of three of the four defendants. And maybe in those scenes wherein the four defendants conversed among themselves, the dialogue should have been in German, not English. But these are trivial points. Overall, this is a film that is well written and directed, a film with credible actors giving stellar performances, and most of all, a film that assures preservation of that era's historic significance, with a political and social message that has enduring value. 111 of 143 people found this review helpful. Was this review helpful to you?